"This week, let us remember the parable of the prodigal son .... we are overjoyed of the recent return of one of our own back into our folk. Let us open our hearts in support of [him] as [he] struggles to pick up the pieces of [his] shattered tragic life. And keep us ever mindful of the humiliation of sin, degradation and lack of moral decency. It's not ours to judge. Amen"
GHB is a series of visual works responding to the happenings surrounding my mother’s fashion accessory shop, Vinessa, which was closed down in January 2013. This series present photographs, objects and performance accumulatively in an installation inspired also by my recent return to my birth home in Jakarta. The project is also heavily influenced by a popular wholesale center in Jakarta, Mangga Dua where it has close ties to the artist's family history. Most of the materials collected and production were done in the center which is dominated by Indonesian Chinese-owned businesses focusing in goods imported from China. My mother previously owned an accessories shop called Vinessa in the trading center for a decade before it was forced to be closed due to family conflict. Vinessa is considered a safe-haven for my mother as she has given her all to build the success of her shop and feels comfortable and secure there (the name Vinessa is actually a shortened combination of all three of her children’s names) but at the same time was tied down by our family's financial control and dictatorship. The short notice of Vinessa's closing was a blessing in disguise. She now owns a smaller accessories shop, proudly funded by her own money and separated from the family's finance. I see a coincidental parallel in this scenario to my recent deportation from Singapore. Though on a different scale, the cause and effects of both cases I feel, can somewhat be said to be similar. In GHB, I am introducing seven characters created through accumulation of personal narrative and social observation occurred within the last eight months since relocation back to Jakarta. The characters, presented through installations, objects, photographs and performances challenge the notion of pious captivity, religious hypocrisy, masculine dictatorship and wealth addiction. 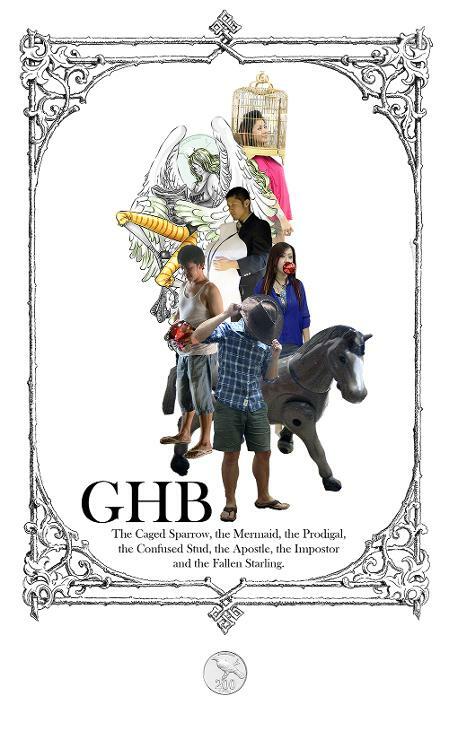 They borrow Biblical citations which have been altered to be presented as brand new narratives.Through the artist's recent interest in characterizing his concerns, GHB presents a space where audience are invited to imagine their own story with the characters, linear or otherwise. Additionally, audience can also notice references from film directors Robert Harling and Ang Lee, mangaka Suzue Miuchi and Eichiro Oda as well as designer Junko Kawano. This first part of the presentation was on the last two days of the shop’s existence – 5 and 6 January 2013, before my mother hands over the shop’s ownership. This work will also be the documentation and last memory of Vinessa, before my mother embarks on a new venture starting a smaller fashion accessories boutique. The second was in Asbestos Art Space in Bandung, Indonesia.